There’s evidence of this understanding in a speech Douglass gave on the Fourth of July, 1852, in Rochester, New York. He praises the fight for justice and self-determination of the American colonists who, before an all-out war began, waged a nonviolent campaign against British rule. Isn’t there something odd here, though? We remember Douglass now as one of our greatest fellow Americans—or so we should. But why does he speak like this, in the second-person? “Your fathers”? “Around you“? 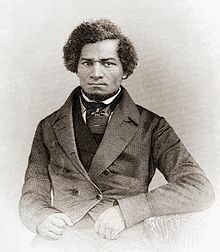 I was recently reminded in passing—in the middle of a conversation about making a flag cake, actually—that Frederick Douglass didn’t celebrate Independence Day. Of course. How could he? Douglass was born a slave. This country’s independence was not his own, or his people’s. That, in fact, is what the 1852 speech is really about. A bit later on, he makes his meaning more plain. The blessings in which you, this day, rejoice, are not enjoyed in common. The rich inheritance of justice, liberty, prosperity and independence, bequeathed by your fathers, is shared by you, not by me. The sunlight that brought light and healing to you, has brought stripes and death to me. This Fourth July is yours, not mine. You may rejoice, I must mourn. To drag a man in fetters into the grand illuminated temple of liberty, and call upon him to join you in joyous anthems, were inhuman mockery and sacrilegious irony. Do you mean, citizens, to mock me, by asking me to speak to-day? What, to the American slave, is your 4th of July? I answer; a day that reveals to him, more than all other days in the year, the gross injustice and cruelty to which he is the constant victim. To him, your celebration is a sham; your boasted liberty, an unholy license; your national greatness, swelling vanity; your sounds of rejoicing are empty and heartless; your denunciation of tyrants, brass fronted impudence; your shouts of liberty and equality, hollow mockery; your prayers and hymns, your sermons and thanksgivings, with all your religious parade and solemnity, are, to Him, mere bombast, fraud, deception, impiety, and hypocrisy—a thin veil to cover up crimes which would disgrace a nation of savages. There is not a nation on the earth guilty of practices more shocking and bloody than are the people of the United States, at this very hour. Perhaps Douglass should have changed his second-person address to first-person plural. Can any of us can really sing the Lord’s song in a land where some are in chains? Whether one celebrates the Fourth of July or not is, I think, a matter of personal conscience. If one does, it’s how that matters. (Recalling Douglass would be a good way to start.) And, in either case, may all Americans take this day of fireworks, of pride, of bravado, to reflect on what we can do to help our country live up to the still-unfulfilled promises upon which it was founded, and then some.